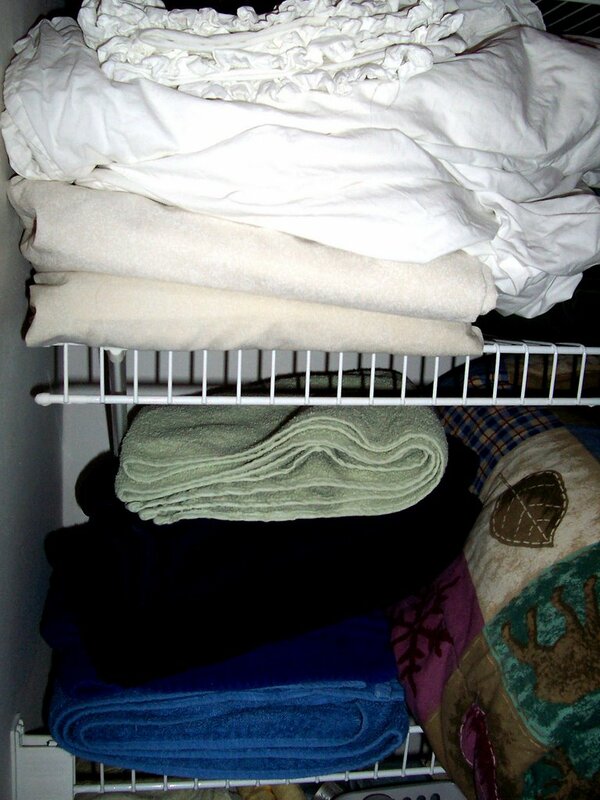 Continuing my series from yesterday, I will now enlighten you, internet, as to the contents of my linen closet. 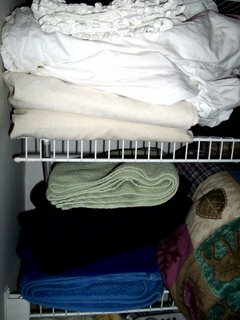 My linen closet is actually inside my "Guest Bathroom." 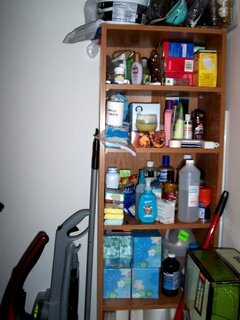 You know, the one that looked all clean and cute and organized? And . . . well . . . some other stuff . . . I'm not even sure what to say here. You see, I save every free sample I get, I buy everything I can on sale, preferably in bulk, and I HATE running out of things. On the upside, though, when we had some Katrina evacuees (families with small children) move into our apartment complex last year with little more than their cars and the shirts on their backs, I was on their doorstep with paper towels, toilet paper, tissues, trash bags, toothpaste, toothbrushes, childproof outlet covers, and diaper wipes, all neatly organized in re-used grocery bags, less than ten minutes after I heard they'd arrived. Then when my husband got home, I said, "See? This is why I insist on buying tubes of toothpaste in five packs! In case of hurricanes!" Hmmmm, Maybe I will show you MY linen closet. And I totally "get" the gathering instinct. I'm the woman who bought her daughter 10 bathing suits last year for THIS year - cause LL Bean had marked them down to 1.99. I too am a gatherer. My hubby calls me a pack rat, but I don't have a problem throwing out worn out toys, books that are torn up or have been dropped in water, stuff like that. Sams is my friend, until I get to the checkouts. My fear of running out of toilet paper is an expensive habit to keep. And there's never any reason not to buy 12 boxes of Kleenex at a time. Or for that matter, 10 LL Bean bathing suits for 1.99 a piece. That's a good bargain! I am a wannabe gatherer, someone who gathers, but gathers the wrong things. For instance, I currently have a ten gallon drum of Goldfish crackers in my kitchen, but last night when my daughter yelled from the bathroom, "We're out of toilet paper!" I was like, "But I bought some last month!" dude, you *are* insane. insanely hilarious! I love the linens/supplies show. keep it up. ...I have a nasty habit of running out of things. It happens all the time. Boyfriend goes to the store and says "honey, do we need any toothpaste?" and I say "oh I'm sure we've got some" and he knows better than to ask me to check lest I bite his head off and he won't check himself because the linen closet makes no sense to him. Then that night, we run out and find there's not another tube to be found. He has a really hard time containing his grin. So kudos to you for having a linen closet that serves it's purpose! !